The Pros, the Cons, and the Facts in this Cooking with Charcoal vs Gas Grills showdown. Perhaps the greatest BBQ debate of all time is Cooking With Charcoal vs Gas Grills. I am sure you have heard it discussed before and if you are an avid griller, chances are you have been right in the thick of it at some point. Bring this topic up to any seasoned griller, and you will be met with some very strong opinions. I have friends who swear by one and who absolutely refuse to use the other. Charcoal enthusiasts scoff at the idea of using gas and ridicule anybody who would even suggest it and vis a versa. The war between charcoal grill and gas grill users has been raging for years and will spark many a lively discussion right up there with other BBQ debates like “beef or pork,” “sauced or rubbed,” “vinegar-based vs. tomato-based” sauce and Blondes vs. Brunettes. But what are the differences and which option is better? Well, we are talking about different rules, different skills, a whole different ballgame really. The end results may be similar, but getting there requires different techniques. No matter which side of the fence you are on, I am here to tell you that there are pros and cons to each option and depending on your situation, either or both can work for you. Today I am going to give you enough information for you decide what is best for you. Let’s jump right in with the pros and cons of each. When deciding whether charcoal or gas grills are better, let’s dive deeper into their general specs. It’s no secret that grilling with charcoal or wood will give you a deep, smoky flavor especially with slow cooking meats like ribs, brisket, and pork shoulder on indirect heat. Real wood fired flavor that you just can’t get from a gas grill. To me, nothing says BBQ more than the mouthwatering Smokey goodness of a slow cooked piece of meat on a charcoal grill. I can go on and on about the flavorful advantages of natural charcoal, but I will save that for another article. Charcoal creates a hotter flame, generally way hotter than a gas grill can achieve, which can be great for the initial sear of meats like steak. Intense and fast heat is what is needed to get your meat charred on the outside while keeping it a nice juicy pink on the inside. At the opposite end of the spectrum, you can generally achieve lower temperatures with charcoal than you can with gas which is perfect for slow cooking and smoking meat. A charcoal grill can easily reach a temperature of up to 900°F or as low as 225°F and even lower. 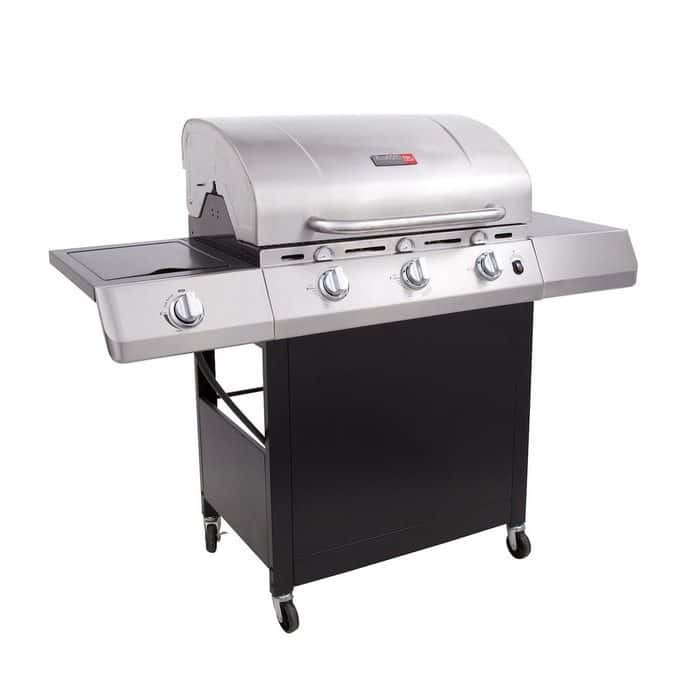 Many gas grills can typically only reach up to the 500°F range with a low of 250°F-275°F range. Because there is a lot less involved in a Charcoal grill, they tend to be less expensive than gas grills. On the extreme low end, you can get something like a small Weber “Smokey Joe” for about $25. A tried and true “Weber kettle” can be had for about $150, while a “higher end model” can be had for about $600. Cooking with natural charcoal can help bring out the inner “Manly Man” in all of us. It is tricky to master the fire and requires much more involvement and attention, but the first time you nail it, the feeling of accomplishment is second to none. Dragging a gas grill to a tailgate party, beach or park is not really an option. You can easily bring, set up and use a charcoal grill almost anywhere it is permitted. Just like any grill, cooking with charcoal has its cons too. For starters, a lot more patience is required when cooking on a charcoal grill. It can take up to 30 minutes just for the fire to get up to the proper cooking temperature (check out these awesome charcoal lighting techniques) compared to about 10 minutes for a gas grill. Of course, this is only a con if you don’t have your favorite beer in hand to help ease the wait. You will have to clean out the ash often and scrub the grates every time you use the grill. Cleaning out the ash is messy, time-consuming and an overall pain in the a$$. It is much harder to control and maintain the heat when grilling with charcoal. It takes some experience and a lot of trial and error to master the art of temperature control with a charcoal grill. The outside weather can play a major factor in this too. Too much or not enough wind can affect airflow which is the key to temp control. Weather that is too hot or too cold can keep you from getting to the desired heat. I know people who will get outside and grill no matter what mother nature can throw at them, myself included. Not everybody will want to be out grilling in the extreme elements, especially those who live in areas where it snows. Obviously, it will be harder to light and keep your fire going in windy and wet conditions. Due to fire and safety concerns, some apartment complexes do not allow charcoal grills, and in some areas, local fire codes ban them all together. You should always check your local codes and laws ahead of time. If you grill with charcoal, people will know. There is no hiding the smoke and aroma caused by the briquettes or wood that sticks to your clothes, hair, and skin after you’ve finished fire grilling that juicy rib-eye steak. Just like a charcoal grill, gas grill supporters can point out many pros that make grilling your favorite cut of meat and awesome experience. A gas grill gives you instantaneous heat and takes only about 10 minutes to fully come up to the desired temperature. When you need dinner on the table fast with and minimal fuss, a gas grill is your huckleberry. Perhaps the biggest selling point for purchasing a gas grill is the convenience they provide when compared to a charcoal grill. Gas grills can easily and quickly be started with a push of a button. There is no worrying about getting those coals to stay lit, wondering when they’re going to be ready or having to shut down the fire when you are done. Propane tanks can provide enough fuel for 16 to 20 hours of cooking time. It is much easier to control the temperature with a gas grill. It is as easy as turning a dial to your desired setting of low, medium or high in most cases. For the most part, the heat produced is even and consistent. No worrying about adjusting vents or air flow. You can even close the lid without putting out the fire while maintaining the heat. When you close the lid on most charcoal grills, you will be decreasing the oxygen flow and putting out the fire unless you know how to use your vents properly. Gas grills have it’s fair share to cons, especially if you fall into the charcoal grill camp. Because there is a lot more involved, gas grills tend to be more expensive, and assembly could be difficult. You can pay for assembly at many places you purchase your grill, but this will add another factor to the total price. 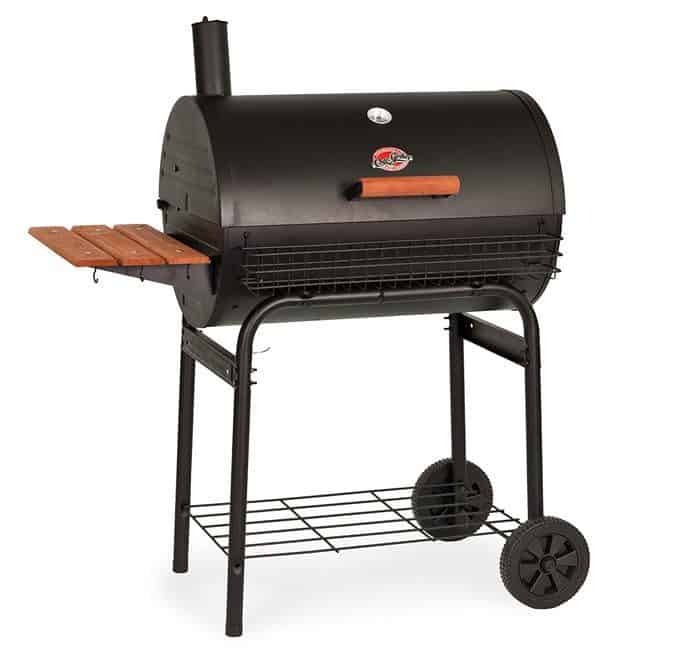 Prices start around $129 to $299 for the most popularly priced (but cheaply made) gas grills. A mid-range gas grill can run around $800 with the top of the range premium gas grills can cost as much as $5,000 and beyond. You will need to check the gas connections and lines from time to time. Parts can also rust or fail or wear down. You will also need to take trips to refill your propane tank when it is low. A good “grill cover” can help minimize the exposure to the elements and is recommended. Gas burns relatively cleanly and has no order or taste, so you won’t be getting that wonderful Smokey wood flavor. This doesn’t matter as much for short cooking foods, where the flavor can be as good as charcoal, but indirect cooking and smoking won’t give you same flavor. While you can still technically smoke meat in a gas grill, no matter what anybody tells you, it is not the same. Some of the higher end grills have built-in smoke boxes that you could add wood chips too, but for most, you will need to add homemade foil packets filled with wood chips and put them directly on the burner. There are a few other options for added smoke flavor you can find out there as well. The biggest issue when trying to smoke is that most gas grill lids do not seal well (a built-in safety precaution because of the gas), so a lot of the smoke is lost. Ultimately, your final choice on the debate of Charcoal vs Gas Grills will come down to cost, how much time and effort you want to put into it, convenience, and flavor. I’m lucky enough that my wife allows me to own three grills (gas, charcoal, and pellet smoker). I use each for whatever the circumstance calls for. Sometimes it just depends on how I am feeling on any given day. Other times I use more than one option simultaneously. I am a bit of an extreme case (head case some might say) though, and more than one option is not needed. There is no question that great tasting BBQ can come from either gas or charcoal grilling but no matter which you choose, I would always recommend that you read the owner’s manual before the first use, so you know exactly what you need to do to get the most out of your grill. Which outdoor Grill have you used before? 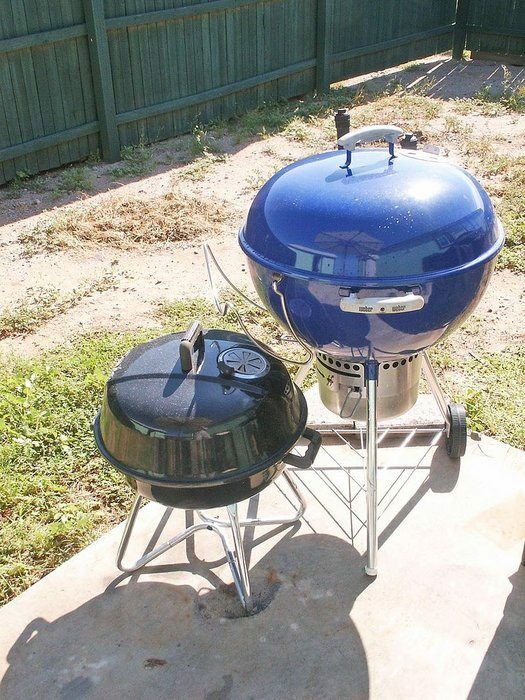 Do you prefer a Charcoal or Gas grill and have any tips to share? What features do you typically like to see in a grill? Are you going to be purchasing a smoker in the future? 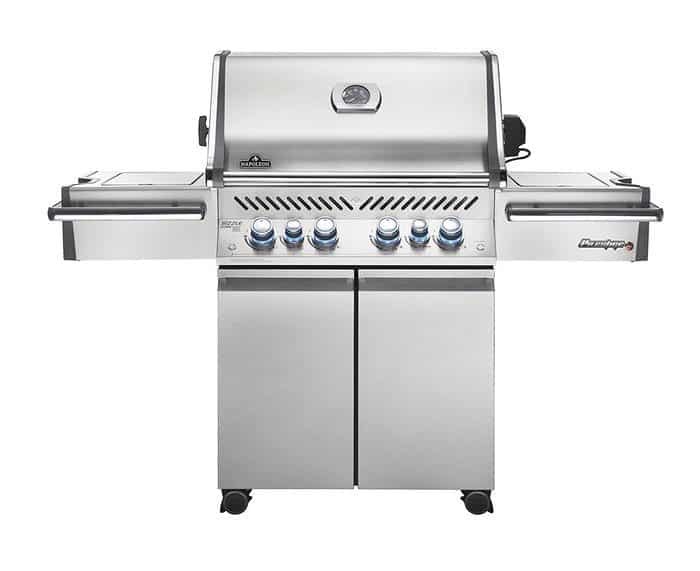 Or do you plan on looking at a pellet grill, built-in or standalone gas grill, or charcoal model? If you still have questions, please feel free to send me a message. How Does a Propane Smoker Work? – The Convenience May Surprise You Electric vs Charcoal Smokers: Which One Is Best? More Importantly, Which One Is Best For You? Oh this article is perfect for me! I’m completely a grilling novice, I will admit. So the way you broke down charcoal versus gas with detailed pros and cons is exactly what I needed to read. I recently purchased a gas grill, and now I’m certain I made the right choice for myself and my lifestyle. It’s so quick and easy to use! Hi and thank you for your comments. I’m glad this info proved useful to you and happy to hear you made the right choice. If you ever need any advice or tips, I would be happy to help. In the meantime, happy grilling. I always preferred charcoal grills over gas grills. It seemed the meat tasted better on a charcoal grill. I can understand people liking the gas grill better because the meat cooks quicker and easier to clean. These are good reasons, but I can be patient and wait on a charcoal grill. Hi Kevin and thanks for stopping by. I am like you and would rather go the charcoal route, but sometimes a gas grill can be just so darn convenient. Let me know if you ever need any advice for your next barbecue. Very well-written comparison. Bring out the pros and cons of each method. Well here. When you are outdoor, we go for charcoal. But when in an air-con restaurant. elect and gas is the only allowed. Thanks for stopping by Ian. I appreciate the comments and I am glad you enjoyed my article. Let me know if there is anything else you may find interesting and I will be happy to include it in a future post. Happy Grilling! Personally I have always preferred Charcoal. I used to swear I would never buy a Gas Grill. I perfected my technique at getting the coals hot and became an expert at grilling. Any Family or Friends BBQ I was always called in as “the Guy” to get it going. Often after disastrous attempts by others. I now mainly use GAS! Why well I tried one. Rather than Simply Sticking to my guns and refusing to give it a go. What I found I loved about the gas was just the simplicity. I actually had SO many more BBQ’s Simply because the speed and time taken to get it up and running. Even Simple suppers can now be slapped on then BBQ. I still love Coal and it does give a (slightly) better flavour, but the mess time and effort really only ever lead to me using it very infrequently. Your Post does a very good job at weighing up the pro’s and cons. Unlike you I’m only allowed 2 Grills but its the Gas that gets used far more often. I agree with you about the simplicity factor when it comes to using a gas grill over a charcoal one. On the other hand, there is a definite flavor difference as you pointed out. I think it all comes down to how you like to cook and personal preference. If you like to slow-cook your food and enjoy a smoky, charred-at-the-edges result, then you may prefer a charcoal grill. However, if you need a fast feast, or would rather steer clear of this distinct smoky flavor, you might want to consider a gas grill instead. I am still predominantly a charcoal guy, but I mix in my gas grill from time to time, mainly for speed and ease of use. Here is another good article about choosing between charcoal and gas that may be helpful as well. Very good article. I myself consider my self a pretty good griller. I currently own a gas grill and Weber Master Touch. I have a specific use for both my grills. the Gas grill I will use for burgers, hot dogs etc. If I’m making steak, chicken etc, then I use the Weber. By the way, I never use lighter fluid. I think it alters the taste of the food. I’m considering acquiring a pellet smoker, any recommendations? There are definite pro’s for both gas and charcoal grills and the fact that you are able to have access to each are a plus. You can’t go wrong with either when all is said and done. Pellet grills are another fast growing option that definitely has its pluses as well. I wrote an article that includes some great pellet grill info and options that you can read here, or here. I hope that helps. Let me know if I can help in any other way.